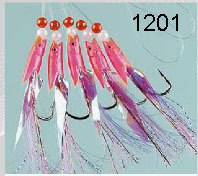 Red hokkais 1201 standard size red hokkais, with crystal flash, angel hair & fish skin all on 5/0 hooks with beads in front, tied on .06mm/40lb mono. Great fish box fillers, baited or unbaited they sort out the table sized fish from the rest. A double hokkai body over extra long chicken hackle feathers & fish skin, mounted on 3 size 6/0 tinned Kirby hooks on 0.8mm/60lb mono. A long established old favorite fish catcher that works anywhere. Made from purple tinsel, & silver foil with lumo size 3 hokkai heads & tied on 0.6mm/40lb mono with 2/0 tinned O'Shaughnessy hooks. Once again purple is a great colour over wrecks & reefs in shallow water (less than 100ft) when the fish are finicky. This size also works well baited over clean ground for all sorts, we have had gurnard, bass, & even good plaice three at a time ! the rig is 1.5m total length. 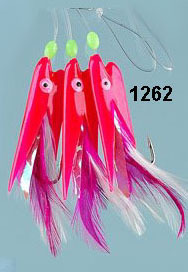 the hooks are dressed with feathers, tinsel & fish skin, with lumo & red beads in front of the hooks, for extra attraction. 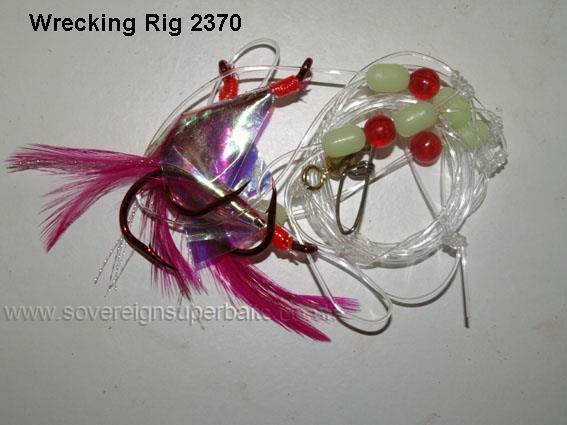 A great rig built to catch big Cod & Pollock. on our trip to Norway we tried these baited with a small piece of herring & we constantly had small to medium wolf fish on the bottom hook & two small(table sized) cod above. Great for fill the fish box quickly ! 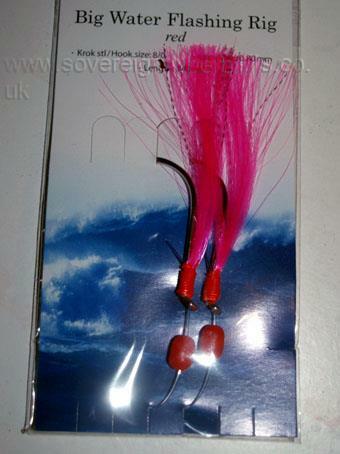 The hooks are dressed with flo pink angel hair & crystal flash which pick up the smallest amount of light to attract fish. These took all sorts in Norway baited & unbaited. Over channel wrecks they sorted out the bigger cod, we had none under 12lb on these, plus a couple of ling without bait ! 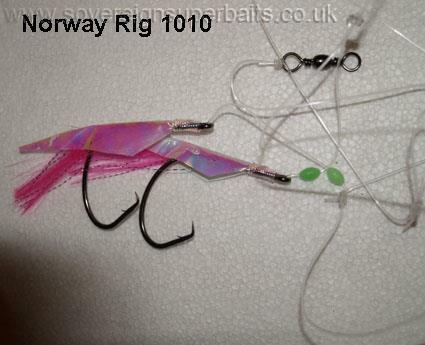 Yet another in our "Norway" range this rig the 1010 has 2 size 10/0 circle hooks tied with angel hair, crystal flash & fish skin with a lumo bead in front. The whole rig is tied on 0.9/80lb mono& is 1m in length. In Norway these proved deadly when baited, taking the better fish, back home over the channel wrecks they worked fine without bait & the circle hooks meant there was no need to strike, the Cod just seemed to hook them self's. Notably we have had one complaint about these, A guy up in the northeast used these baited above a 600gm pirk over a north sea wreck, hooked three big cod & broke his rod !! The lesson here is "Don't be greedy" !!! 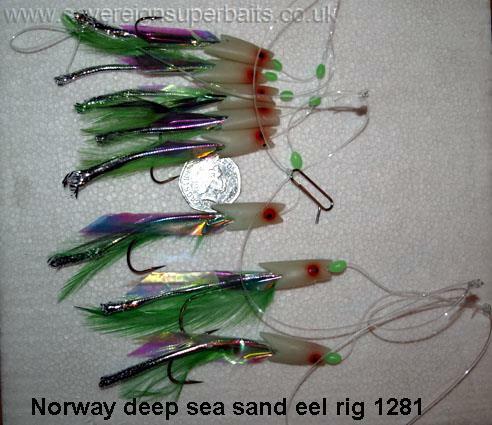 Norway deep sea sand eel rig 1281-7/0, this is the big / Norway version, (smaller version here) with 3 size 7/0 long shank tinned Aberdeen hooks. 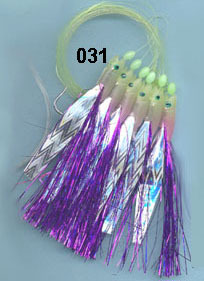 Dressed with green feathers, Mylar piping & fish skin, caped off with a lumo white hokkai & lumo bead. All tied on 1mm/100lb mono. Great bottom rigs, we have had some nice surprise catches on these ! On one drop in Norway we had a cod, a wolf fish & a coal fish all at the same time.